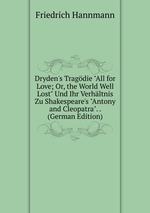 Аннотация к книге "Dryden`s Tragdie "All for Love; Or, the World Well Lost" Und Ihr Verhltnis Zu Shakespeare`s "Antony and Cleopatra". . (German Edition)"